The night is cold, the sky a blanket of darkness. A thunderous assault of water lashes down on Toowoomba’s Queens Park, continuing to grow in volume and strength as it richochet’s off thousands of tents . Peering through the flaps of the media tent I see little grass shoots spiking upwards as if determined to stay above the murky water that is rising rapidly underfoot. I take a tentative step and then recoil at the iciness that envelops my foot. Turning back to those trapped inside, we look at each other in amazement at the suddenness of what is happening outside. And although the power is out, the waters are rising and everyone is cold and wet, we have just one major concern. “How on earth will Switchfoot go onstage?”It is Saturday April 23rd, only the second night at Easterfest, and the headlining act is due onstage in one hour. Meanwhile outside there is a gigantic crack, as the center of the festival entry tent collapses inwards from the pressure of the rain. You’d think that all was lost, but as I venture out into the storm I see hundreds and hundreds of people dancing around the stage like there’s no tomorrow. Come hell or high water, nothing could dampen the spirits of loyal Switchfoot fans, and likewise, there was nothing that could stop the band. As the boys make their way onstage the excitement of the crowd is barely containable, and as Foreman’s voice rang out across the rain soaked grounds it was clear that this would be a night to remember. 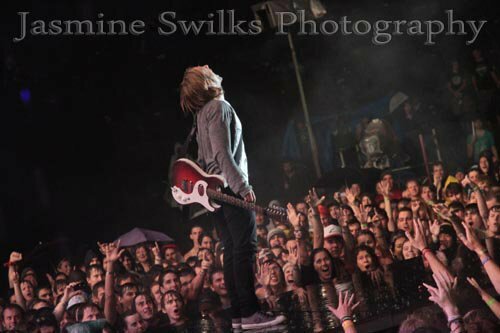 Like a beast unleashed, Switchfoot perform with a frenzy that can only be matched in intensity by the raging storm. Over and over throughout the night I wonder to myself, if this is how they perform with watersoaked equipment, a slippery stage and hair plastered to their faces, how much more could they give us on a clear day? It seems impossible to imagine a better performance. As I furiously snap away on my camera it is hard not to become lost in power of Foreman’s voice, but as I see the hundreds of giddy faces and outstretched hands of the audience I know that these are moments I must capture. There is barely a moment that Foreman is not beaten by the wind and rain. Yet he strides resiliently, he sings boldly, he smiles wildly like a cheshire cat, spending the majority of the set performing on the walkway surrounded by fans rather than in the safety of the undercover stage area. At one point he climbs fearlessly up the scaffolding side of stage, suspended above hungry hands. His energy is infectious. Standing at the end of the runway stage, head thrown back, his white tshirt clinging mercilessly to his body, Foreman is lost in the moment. Above the screams of the fans I hear his voice clear and heartfelt. “I will never in my life forget this night”. Clearly Foreman is not the only one. Next CAN I HAVE SOME ENGINE CLEANER WITH MY MAKEUP PLEASE?